The Cause Church is bringing the party to a neighborhood near you! Look for a Pop Up Parties yard sign in front yards or use the map above to find a location near you. 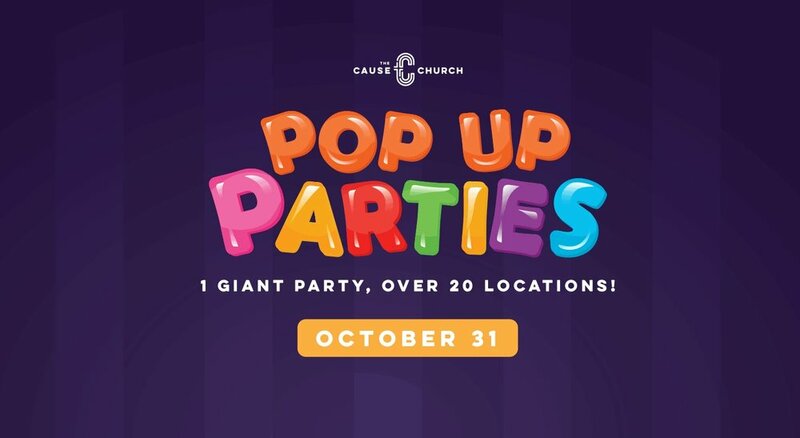 We are The Cause Church, a group of people who love our community and want to offer a friendly, non-scary option for Halloween. We want to get to know you and you get to know us, so we are bringing the party to a neighborhood near you. Each Pop Up Party is hosted by a group of volunteers from The Cause Church. They'll be easy to spot wearing a "Cause" t-shirt. You'll find a brightly lit location that will take away the "scariness" from trick-or-treating. You can enjoy some delicious candy (we will have LOTS!! ), a bounce house (at most locations), carnival style games and a chance to connect with your neighbors. Come on out for some fun! Find a Pop Up Party near you!